1. The present PRSP (or EBRP) of the Government of Bolivia represents a further step in a continuing effort by the government to reduce poverty through stable growth and policy actions targeted to the poor. The strategy places emphasis on reaching out to excluded groups, and increasing the effectiveness and efficiency of institutions in the public sector. It is balanced, comprising not just a social sector strategy but also recognizing the centrality of economic development, and of issues of vulnerability and institutional effectiveness, for an effective overall poverty reduction strategy. 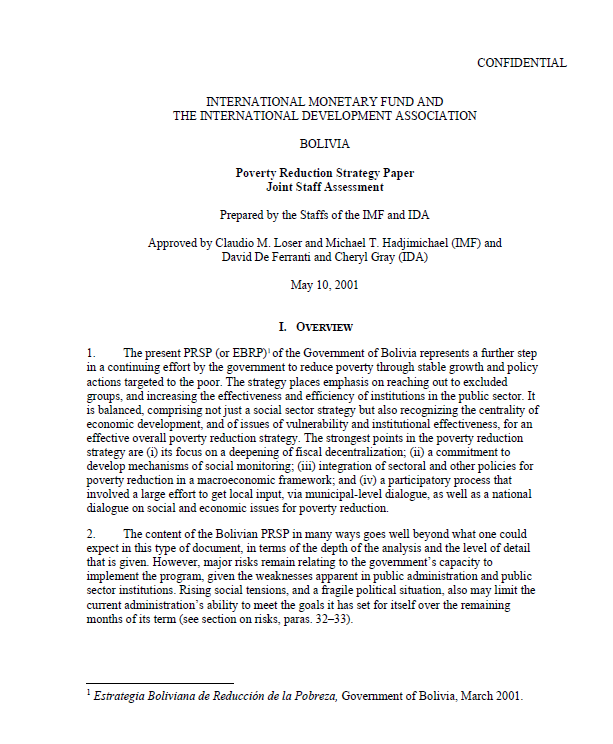 The strongest points in the poverty reduction strategy are (i) its focus on a deepening of fiscal decentralization; (ii) a commitment to develop mechanisms of social monitoring; (iii) integration of sectoral and other policies for poverty reduction in a macroeconomic framework; and (iv) a participatory process that involved a large effort to get local input, via municipal-level dialogue, as well as a national dialogue on social and economic issues for poverty reduction. 2. The content of the Bolivian PRSP in many ways goes well beyond what one could expect in this type of document, in terms of the depth of the analysis and the level of detail that is given. However, major risks remain relating to the government’s capacity to implement the program, given the weaknesses apparent in public administration and public sector institutions. Rising social tensions, and a fragile political situation, also may limit the current administration’s ability to meet the goals it has set for itself over the remaining months of its term (see section on risks, paras. 32–33). 3. The EBRP builds on a previous process of national dialogue for poverty reduction. The first national dialogue started with the new government in 1997, and resulted in a four-pronged plan for sustainable growth, social development, institutional strengthening, and eradication of drugs. Although substantial efforts were made by the government to implement the strategy, especially in the area of coca eradication, there was little follow-up before the inauguration of the 2000 Dialogue. An interim PRSP was drafted soon after the enhanced HIPC initiative was launched, and discussed by the IDA and IMF Boards in January and February 2000. The I-PRSP document was seen as lacking clear priorities and had little participation in its preparation. 4. A new national dialogue was launched in April, 2000 to promote participation in the preparation of the PRSP, despite a difficult political environment. Before the national dialogue started, various groups of civil society mobilized to prepare their own dialogues. These groups included the Jubilee 2000 Forum of NGOs, sponsored by the Catholic Church, and groups representing small producers, indigenous people, and miners. The National Dialogue itself was designed as a bottom-up process with discussions taking place first at the municipal level, then passing to the regional level and culminating at the national level2. Each municipal table was attended by the mayor, the vice president of the municipal council, and the president of a vigilance committee. Four topics were discussed: determinants of poverty, mechanisms for the allocation of HIPC resources, citizens’ participation in monitoring the use of HIPC debt relief resources, and follow-up and periodic renewal of the national dialogue. 5. The nine departmental round tables, which took place during nine weeks between July and August 2000, included delegates of the municipal round tables, the Jubilee 2000 Forum, central government, and civil society. Government participation in departmental round tables was limited, with high-level government participation in only three of the nine departments. The departmental meetings focused on priority actions at the regional level for the fight against poverty; citizens’ participation in the monitoring of resources for public investment; the content and institutional framework of public policies; and follow-up of the national dialogue. Despite this effort to bring the participatory process closer to people by decentralizing it, NGOs and civil society groups have raised questions as to whether: (i) some consultations were unduly influenced by local decision makers, (ii) vulnerable groups were well represented, specifically women and indigenous people, and (iii) the methodology used promoted real participation, in that it was highly structured, and the agenda of the discussions was not sufficiently flexible. Nonetheless, most observers agree that the government has made a good faith effort at utilizing a participatory approach in developing its strategy, and has laid the groundwork for an ongoing participatory process for monitoring the strategy. 6. The national round table in August, 2000, included delegates of the municipal and departmental round tables, ministers and vice ministers from the central government as well as representatives of civil society, including indigenous groups. Six sectoral topics were discussed: support to production, education, health, basic sanitation and housing, land, and environment. While there was little discussion of macro themes, some structural issues were discussed, including tax policy and administration, the need for labor reform, trade policy, and the regulatory environment for businesses. The representation at the national level from the political parties and the legislature was very low. Representatives of the business sector did not attend municipal round tables and only moderately participated in the departmental round tables. Agreement was achieved on various topics, including: (i) the determination of priority policy areas: productive infrastructure, support for production (access to microfinancing and other credit), education, health, and land tenure; (ii) the definition of an automatic mechanism for the distribution of HIPC resources; and (iii) the need to establish social oversight and monitoring mechanisms, which would give civil society a role in monitoring the utilization of HIPC resources. As a result of the dialogue, the attached PRSP was prepared. Annex III of the document shows in matrix form the issues raised in the national dialogue, and how they are treated in the EBRP.